If you can do without people but want fun t-shirt then you need to check out this I hate people t-shirt. The shirt is available in styles for men and women and is available in many colors and in sizes Small – 6XL. 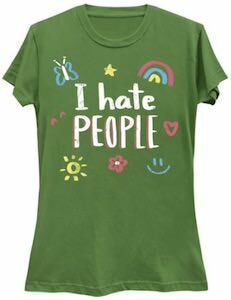 On the t-shirt you can see lots of things and all seems to put on it in crayons and you can see the sun, butterfly, rainbow, and more and then in the middle you can see the text “I hate people”. So now just put on this t-shirt and have a great day out and people will probably stay away from you because they now know that you don’t like other humans. If you like a fun t-shirt that says that people to stay away then you should check out this this I hate people bunny t-shirt. 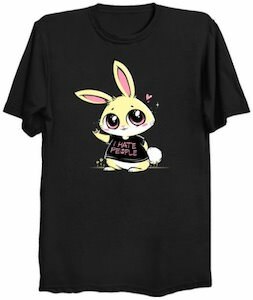 On this t-shirt you can see a cute yellow bunny and even has a little heart next to it but if you look closer you can see that it is wearing a t-shirt and on it you find the text “I Hate People” and it even has a little skull on it. You can get this fun t-shirt in styles for men and women and it comes in many fun colors and in sizes Small – 6XL so that you can get the shirt that you really love. 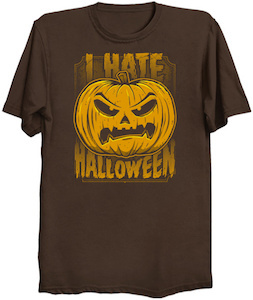 Some people love Halloween and if you don’t then you should get this I Hate Halloween t-shirt. 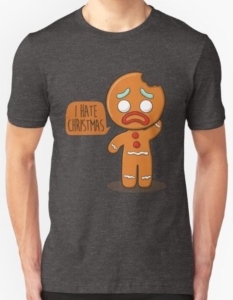 On this t-shirt, it shows a big carved pumpkin and it does not look happy and maybe it is because of Halloween as it says “I Hate Halloween” around it. The anti-Halloween t-shirt is available in different colors and in sizes Small – 6XL and in styles for both men and women. So if you want the world to know what you think about Halloween then you should be wearing this t-shirt on Halloween and when you open the door for kids trick or treating. This women’s t-shirt gives a clear message about you and maybe that is why you should be wearing it. 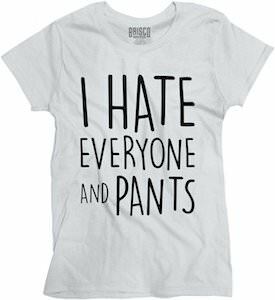 On the t-shirt it simply says in big letters “I hate everyone and pants” and the font is fun and all that makes for a fun t-shirt that people will look at and think and most won’t say a thing but probably agree with you. The t-shirt is made from 100% preshrunk cotton and comes in women’s sizes Small – 3XL. Stop pretending to the world and wearing a t-shirt that tells the world how you really feel is a great start. Shark week is that one week that seals do not like. Maybe it is because people just look at those sharks and forget all about the seals or maybe seal just don’t like sharks. 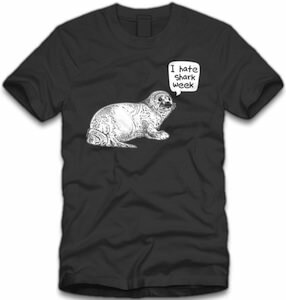 On this t-shirt you can see a cute seal and he says “I Hate Shark Week”. And this funny t-shirt comes in a wide selection of colors and sizes and they have men and women’s versions available of this t-shirt . Are you with the seals and you don’t like shark week? or do you just like to have a fun t-shirt that you can wear any day of the year but specially when shark week is there again. 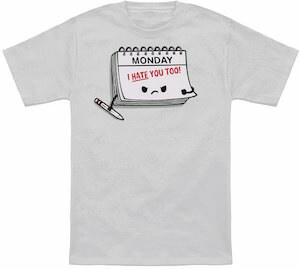 What ever you are thinking right now you just want to see this I Hate Shark Week T-Shirt.